The Infinity system has been designed with simplicity in mind. 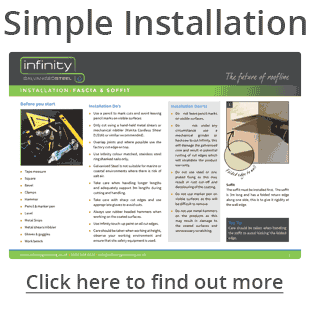 With just four base components it is straight forward and simple to install. Components can be overlapped, eliminating the need for awkward measuring & cuts. Engineered to last it offers designers, architects and home owners a unique option for colour matching the fascia and rainwater system. Aesthetically pleasing and robust, made from pre-coated Galvanised Steel, the system is UV and scratch resistant and backed by a 15-year product warranty.